Sleep is known to be important for learning, memory and cognition. The function of sleep is still not completely understood, however it appears sleep assists with recovery from the previous day and helps prepare for the upcoming day . 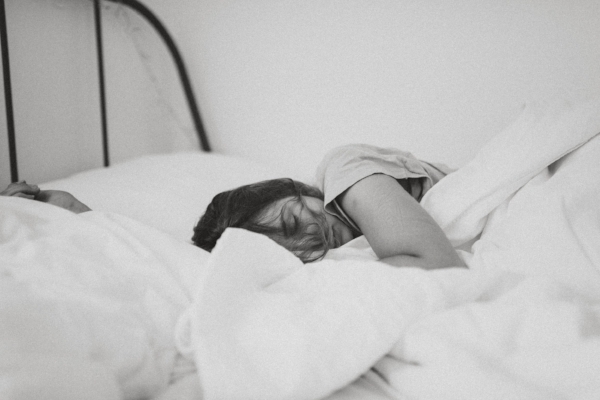 Sleep has been shown to be a vital component of recovery from sport and activity , along with having a consistent association to lower risk of illness and even death . The recommendation is that adults obtain eight hours of sleep per night , as periods of sleep deprivation or poor-quality sleep can impact negatively on cognitive and physiological function. The cause of poor sleep can be multifactorial and with the pressures of daily life leaving most people poor of time, it has become more common for people to be lacking in vital sleep. Some contributing factors that impact sleep quality include personal choice, work, illness/injury, young children, medication, medical conditions, stress/anxiety, caffeine, alcohol, and the environment (e.g. noise levels) . Studies [2, 5] show athletes are often at risk of having poor sleep. The reasons affecting sleep quality in athletes are thought to include the timing of competition (e.g. night games), environmental conditions (e.g. light exposure from stadiums), caffeine ingestion, travel schedules, and heavy training schedules. Concussions have also been reported to cause increased symptoms of sleep disturbance . Adolescent athletes are particularly at risk of poor sleep, with sport and school both factors impacting sleep quality, subsequently increasing their risk of injury . Impaired cognitive function & performance: memory, attention, alertness, learning, response time, emotional regulation, cognition and vigilance are all impaired or reduced. Reduced muscle repair & regeneration: down regulation of protein synthesis pathway that repairs muscle damage, adversely affecting recovery. Increased risk for chronic health diseases: higher risk of type 2 diabetes, obesity, cardiovascular diseases. Increased perceived exertion: higher RPE (rate of perceived exertion) reported during activity, sport and exercise. Increased inflammation: increased pro-inflammatory cytokines (proteins which are secreted by certain cells of the immune system and have an effect on other cells) (TNFa, PGE2). Altered endocrine function: increased cortisol (stress hormone), with reduced growth hormone and testosterone. Reduced immunity: increased risk for infections (e.g. upper respiratory tract infections). Increased pain sensitivity: higher risk for chronic pain, especially back, shoulder and neck. Impairs nervous system activity: increased sympathetic nervous system activity. Impacts mental health: increased mood disorders and risk of depression. Impaired muscle glycogen repletion: this affects energy stores and recovery. Reduced appetite: this then subsequently affects muscle repair, recovery and performance. Exercise: Regular exercise of moderate intensity is recommended to assist in improving sleep quality . Sleep Environment: optimising your sleep environment through factors such as noise and light control can be beneficial . Nutrition & Diet: high protein diets may improve sleep quality, whilst foods high in melatonin (e.g. tart cherries) may assist in decreasing sleep onset time. Minimal calorie diets can impair sleep quality if too low . Sleep Duration: expanding the amount of sleep time . Monitoring: regular monitoring of sleep quality, mental health, physical function and other wellness measures can be important, especially in athletic populations . Need to improve your sleep and want to know how a physiotherapist can help? Get in touch with your local LifeCare clinic by clicking the button below. Nédélec, M., Halson, S., Abaidia, A. E., Ahmaidi, S., & Dupont, G. (2015). Stress, sleep and recovery in elite soccer: a critical review of the literature. Sports Medicine, 45(10), 1387-1400. Chennaoui, M., Arnal, P. J., Sauvet, F., & Léger, D. (2015). 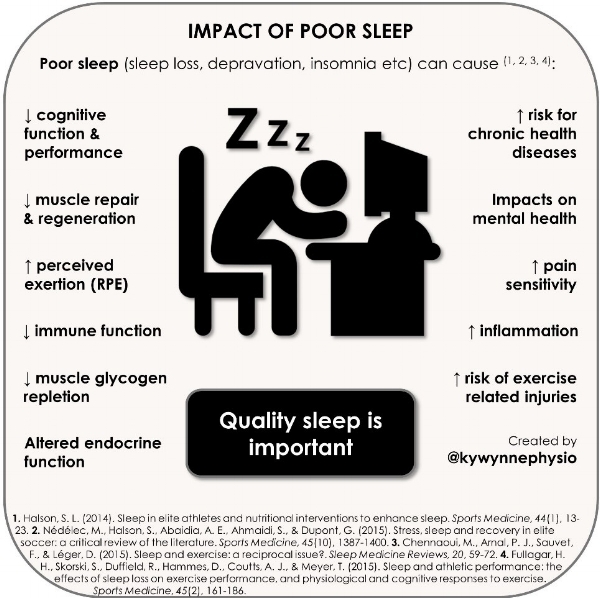 Sleep and exercise: a reciprocal issue?. Sleep Medicine Reviews, 20, 59-72. Better Health (2018). Sourced from https://www.betterhealth.vic.gov.au/health/conditionsandtreatments/sleep-deprivation. Simpson, N. S., Gibbs, E. L., & Matheson, G. O. (2017). Optimizing sleep to maximize performance: implications and recommendations for elite athletes. Scandinavian Journal of Medicine & Science in Sports, 27(3), 266-274. Fullagar, H. H., Skorski, S., Duffield, R., Hammes, D., Coutts, A. J., & Meyer, T. (2015a). Sleep and athletic performance: the effects of sleep loss on exercise performance, and physiological and cognitive responses to exercise. Sports Medicine, 45(2), 161-186.